This station downtown will be made over into what the city is calling "a new landmark." The cost? Over $30 million. Capital Metro is planning some big improvements for MetroRail, the city’s only rail transit line. But one of the big-ticket items on that list of improvements – a plan for a permanent downtown station with a price tag of over $30 million – is being criticized by some as unnecessary and ill-suited to the city's transit needs. MetroRail (also known as the Red Line) got off to a rough start when it launched in 2010, starting several years late and tens of millions of dollars over budget. Still, it's managed to attract more and more riders in the years since, and a typical weekday rush hour these days on the Red Line is standing room only. But the service is hampered by several factors. MetroRail has high operating costs (and subsequently, high rider subsidies), few rail cars and a complicated sharing agreement with freight trains running on the same tracks. 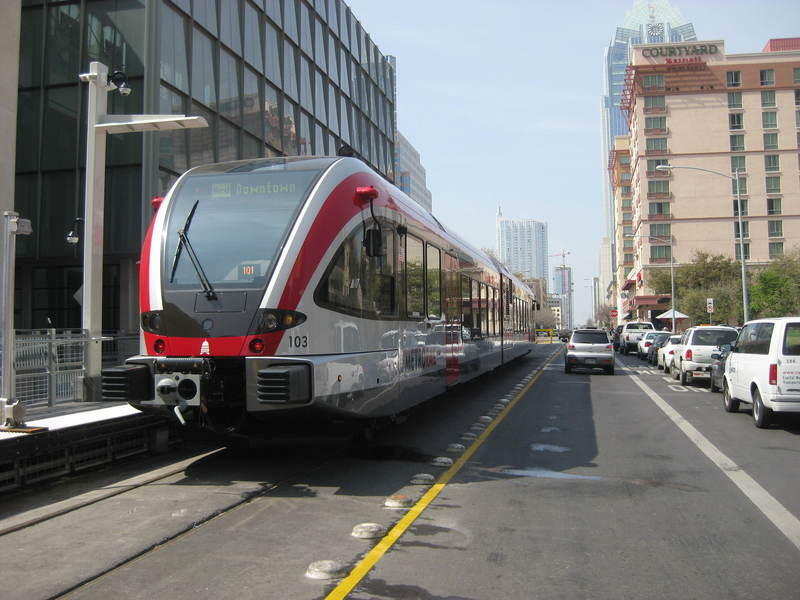 MetroRail is also a very small slice of the mass transit pie in Austin, representing only 2.5 percent of rides on the Capital Metro system. 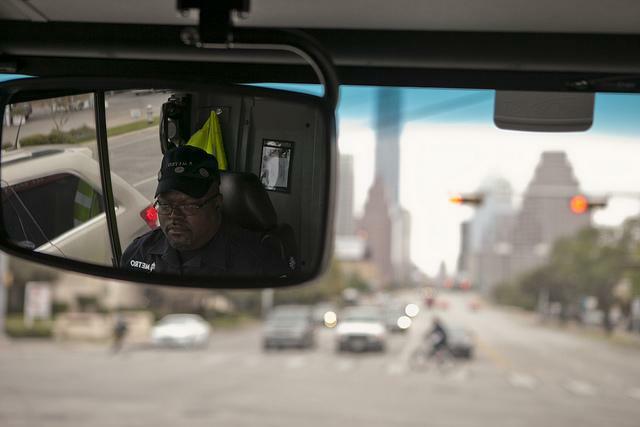 Most of the nearly 110,000 trips taken on Capital Metro everyday are bus rides. Thanks to some state and federal grant money, MetroRail could see real improvement in the coming years. Over $60 million will buy more rail cars, signal improvements and double-tracking in areas so trains can pass each other. That investment could allow MetroRail to drop its current half-hour train frequency schedule in favor of a more efficient 15-minute train frequency during peak periods, and carry more riders at the same time. "By late 2017, 2018, we should be able to effectively double the capacity of that service," says Capital Metro's Vice President of Strategic Planning and Development, Todd Hemingson. "If you look at our system today, there's only one line that is 100 percent congestion proof, and that is the Red Line." The downtown Red Line station at the Austin Convention Center, where the line terminates, is up for a massive makeover as well. 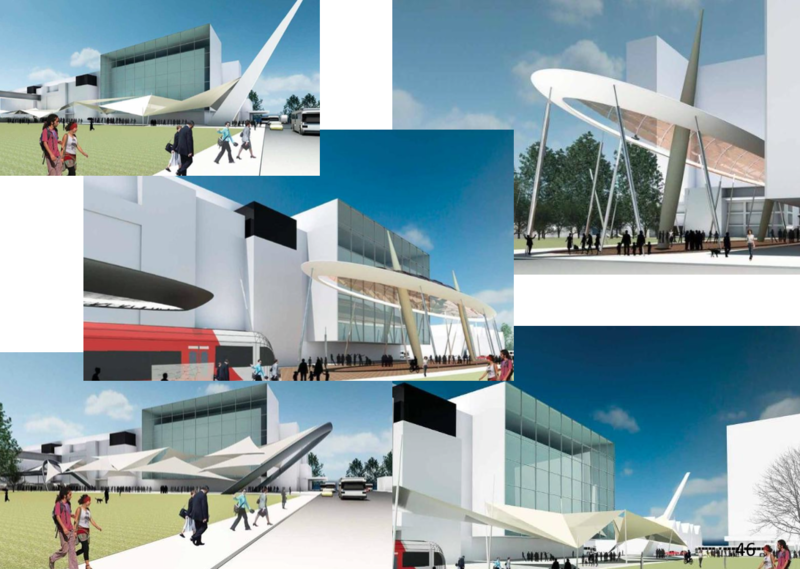 It's going to be turned into some kind of futuristic transit plaza, with huge metal arches and towering glass canopies. Planners are promising a "new landmark," with a cost of $30-35 million. Some of the proposed concepts for a new downtown MetroRail station, projected to cost $30-35 million. "Dubbed the Gateway Station, this project will invigorate the area by creating a dedicated space for transit users, pedestrians and cyclists," says Project Connect, a regional transit planning group behind the effort that includes Capital Metro, on its website. The cost of the station will take up nearly half of the grants for MetroRail. "Meanwhile, our highest ridership stop, in the entire Capital Metro system, at Republic Square [downtown]? We get a sidewalk," says Jace Deloney, chair of the Urban Transportation Commission, referring to the lack of improvements at the city's main bus transit center. That area has minimalist bus stops with coverings that don't always shade riders or protect them from rains. While Deloney is on board with using the grant money to add cars to MetroRail and make the service more frequent, he doesn't think that nearly half of it should be spent on the "Downtown Gateway" station that will serve such a small segment of the city's transit riders. "Transit is about bringing people of different classes together to use public space in a better way, and this seems to go against that idea," he says. Hemingson of Capital Metro says the agency has gone out and gotten grants for more bus service, like the ones that mostly paid for the city's first two rapid bus routes last year. "You know, rail is an important part of our system, and over time it becomes increasingly important," he says. "But the bulk of the ridership, and the bulk of what we do for the foreseeable future [at Capital Metro], will be on the bus side." This time, however, these grants are headed towards MetroRail. "No other projects were considered for this TxDOT grant," says Deloney with the Urban Transportation Commission. "Capital Metro, without going to the public and asking what they thought, they went to TxDOT and said, 'We think we need a downtown station.'" Particularly upsetting to Deloney is that the city still hasn't solved a fundamental problem between these two services: their physical separation. What if you want to, say, start your trip on the bus, head downtown, and then go somewhere on the rail, or vice versa? Well, there's over half a mile of city blocks that you'll have to trek to get from one to the other, with infrequent bus service connecting the two. But this idea is very much in its early stages. Capital Metro says they are designing the new station so that it could still be extended to the Seaholm Development in the future if that becomes feasible. The idea to create a "new landmark" rail station downtown is still just that, as it's still only ten percent designed. But if it ends up anything like the sketches, you can expect something eye-opening when it's done. Unless, that is, you're waiting for the bus a half a mile away.